This post summarizes parts of a paper presented at the Connected Past conference in Paris, April 24 this year, and parts of a paper offered together with my colleague Professor Jørgen Christian Meyer at the ARAM conference in Oxford on July 14. The challenge we’re dealing with is tracing the ancient caravan route from the city of Palmyra to the Euphrates. This part of the Near East is inaccessible to archaeologists, and has been so for a long time. Most existing research dates back to the 1930s, when Antoine Poidebard and Aurel Stein surveyed the route from the air and on the ground, from the Syrian and Iraqi sides of the border respectively. 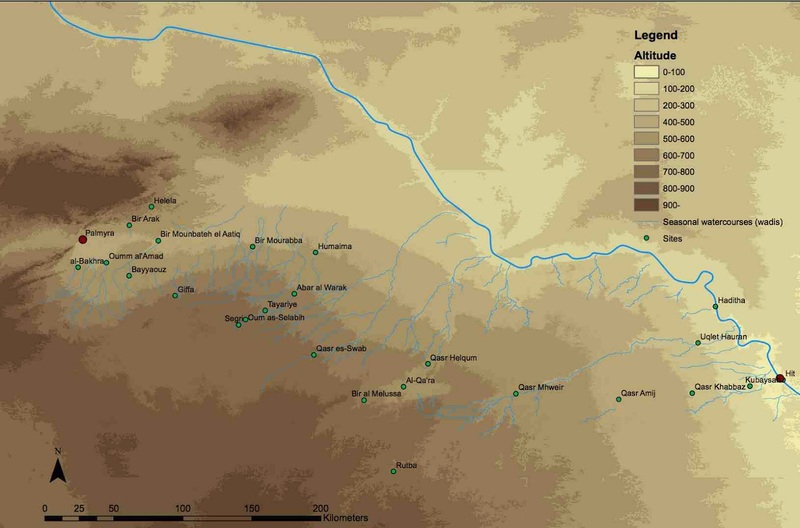 The network analysis is only part of the wider case study, which besides publsihed archaeological work also considers GIS modelling, satellite images, ethnographic accounts, travel descriptions, and the physical environment of the Syrian Desert. Pending peer review, the study will be published in a forthcoming volume of the journal ARAM. 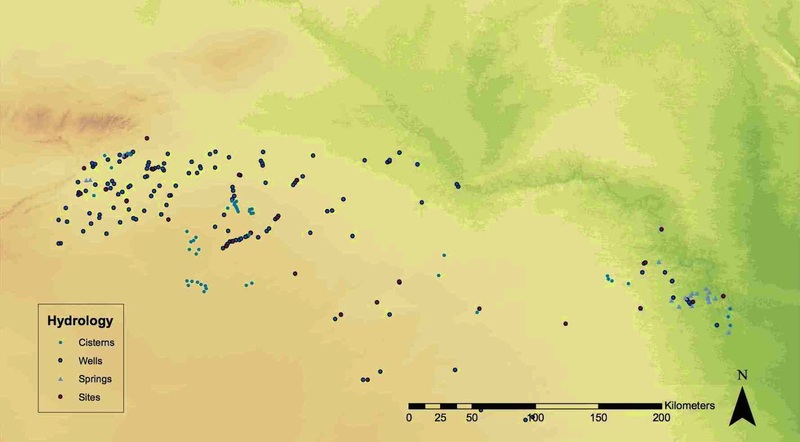 Step one of the Network Analysis was to locate all known archaeological sites in the relevant part of the Syrian Desert (below). This was done on basis of archaeological reports as well as British, French, German and Soviet Maps of the region, cross-checked with Google Earth, the Corona Atlas of the Middle East and Bing Maps. These were plotted in Google Earth, and then imported into Arcmap. Still, considering the scarcity of past archaeological work, we had no idea whether there were not also other sites out there, that might equally well have been stations on the trade route. We decided to approach this by looking at hydrology. If you want to move through the Desert with a caravan, you’ll need to know where to find water. Utilizing 1:100 000 maps imported as overlays into Google Earth we plotted all hydrological features in Google Earth. Imported into ArcGis they look like this (below). Altogether there are 244 of them, wells, springs, cisterns. Can we trust that they were the same in antiquity? To a large extent we think we can. The climate has not changed much. Most wells draw on groundwater and are placed at the bottom of wadis, seasonal watercourses that were the same in antiquity as they are today. Finally, our experience from the area North of Palmyra, where we did survey for four years, is that these wells and cisterns are associated with pre-Islamic pottery, and have thus been in continuous use by the nomadic population. This, however, still did not enable us to trace the route. In order to do that, we turned to network approaches. First, I added a 20km buffer to all hydrological features (below). 40 km is a long day’s march for people and camels alike, and wherever two circles intersect, you can reasonably walk or ride from one point to another within a day, if you know your way of course. You see here that the region close to Palmyra has a high density of wells. Also, close to the Euphrates, the availability of water is good. Whereas in the middle, you have stretches of up to 100 kilometer without perennial water sources. This is a strong argument that a caravan route needed to be created and maintained, and this was something that the Palmyrenes needed to deal with in their period, regardless of the actual age of the ruins that early explorers in the Syrian Desert visited. (The map also shows the routes proposed by Poidebard and Stein as well as the theoretical cost path suggested by Arcmap). I then wanted to turn this into a network. This I did in Arcmap, by automatically creating lines from all hydrological points to all other hydrological points within 40 kilometers. I then exported all points and lines as spreadsheets, keeping information on geographic location intact. These I imported into the Graph software Gephi, using the Geo-layout algorithm plug in developed by Alexis Jacomy. Below you can see what the result looked like. I did the same with the archaeological sites identified by earlier scholarship. 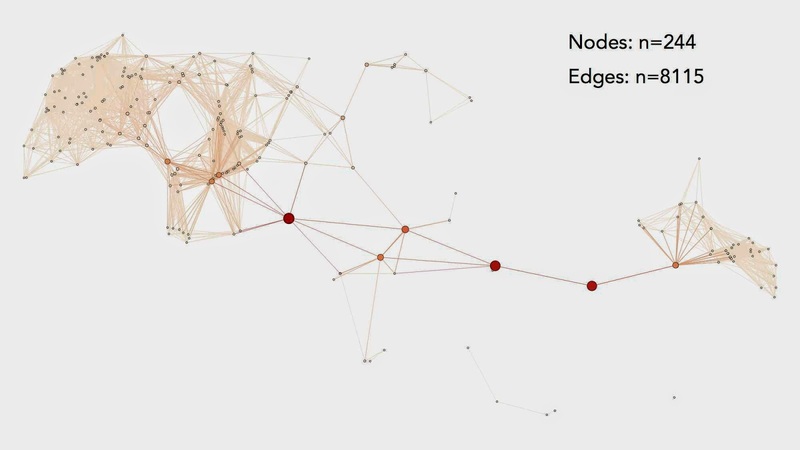 Here, inspired by Cyprian Broodbank and Anna Collar’s use of Proximal Point Analysis, I added the minimum number of edges needed in order to connect nodes to their closest neighbors on all sides. This, I admit, is probably the weakest point of the analysis, as it involved a certain amount of personal judgment. I then merged my two networks by combining the spreadsheets. 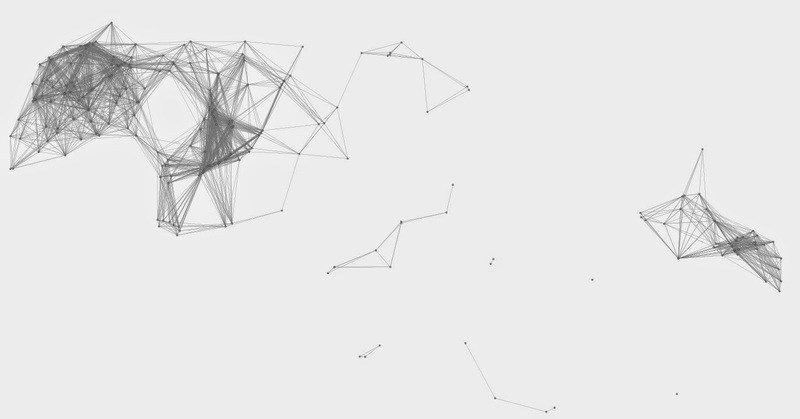 This is the result, with nodes sized according to betweenness centrality. 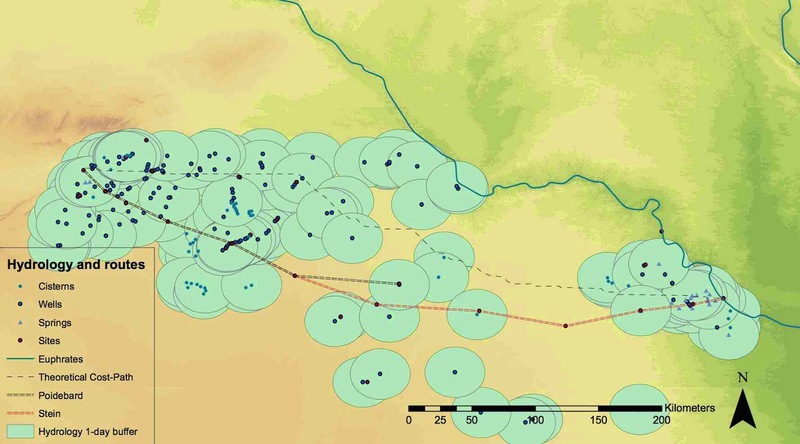 We see very clearly how the areas with good access to water, were connected by places where we find archaeological evidence in the nature of defensive structures or inscriptions, and that these nodes act as gateways, that serve to integrate the network. Calculating shortest paths proved not to be so useful, because there are so many nodes very close to each other and because this treats minor cisterns in the same manner as large fortified stations and major wells, but the measure of betweenness-centrality gives a very good indication that there are some places you simply need to go if you want to have something to drink on your way from Palmyra to Hit. 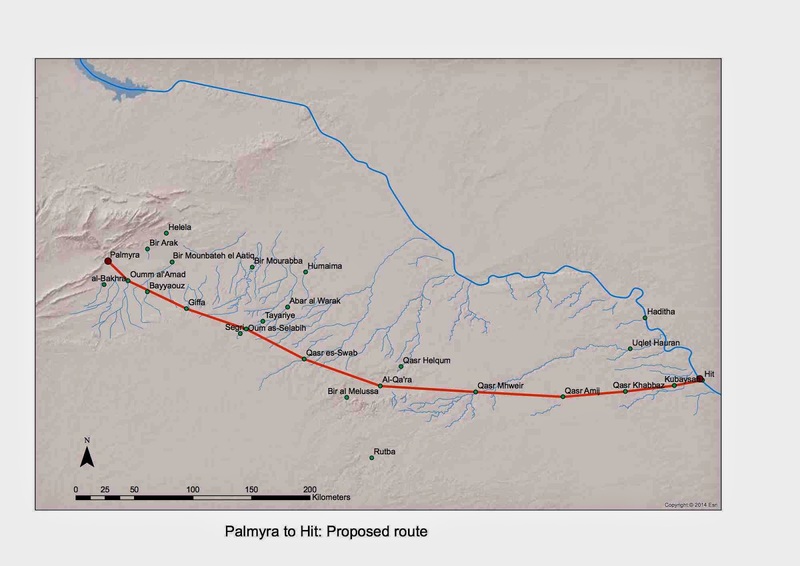 By the way, the shortest path from Palmyra to Hit is 11, coinciding very with recorded travel times of 10 to 14 days. Indicating that the proximal point approach works fairly well. So, in conclusion. What did we learn from this, and what did Network approaches contribute with? In terms of the identifying the trade route, it seems safe to say that Poidebard was correct in Syria and Stein was correct in Iraq. What did we contribute with then. Well, while they followed tracks on the ground, there was no guarantee that there were not other tracks around that they never saw. We have made their conclusion testable, by showing that there simply was no other feasible route if you wanted to go the whole way between Palmyra and Hit in the dry season. In that way the question about the date of the ruins in the desert becomes less important, because whether there were fortifications there or not in the Roman period, the network layout shows that the Palmyrenes needed to pass through this places.